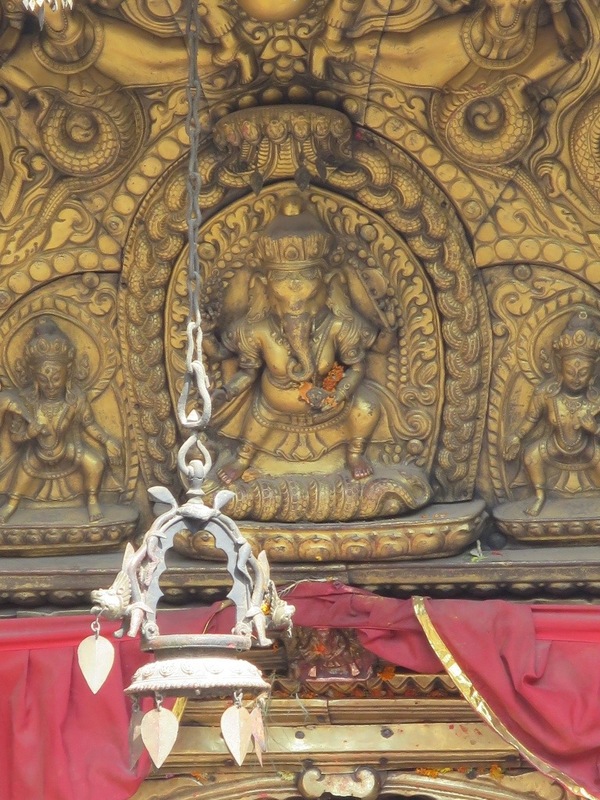 To say that Ganesh is ubiquitous and beloved in Nepal is understatement, way under. 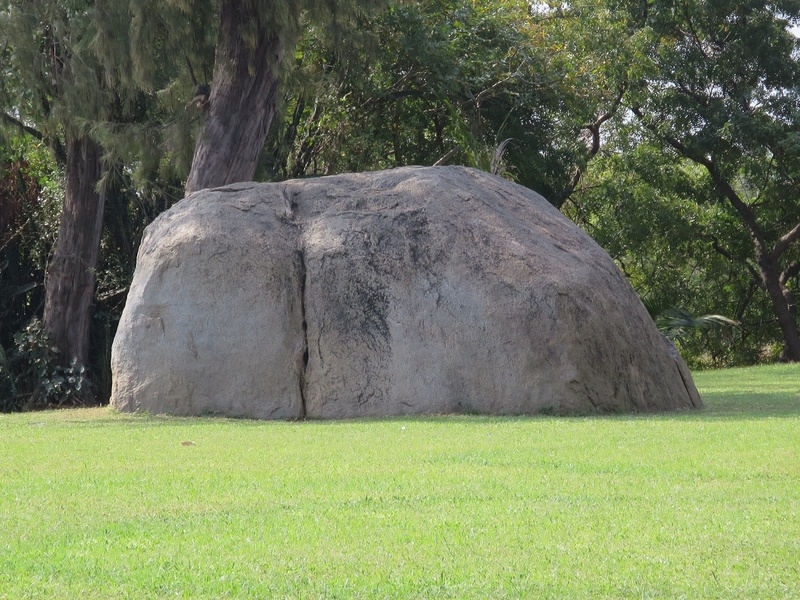 The living presence of gods and goddesses is taken for granted, made visible everywhere there is a pillar, shrine, doorway, gate, niche in a tree, hump of native rock protruding the brick pavement. They are offered incense, anointed with red pigment, sprinkled with orange and yellow petals, smeared with fat, sung to, fed, clothed, washed, stepped over, circumambulated, worn featureless by countless loving hands. 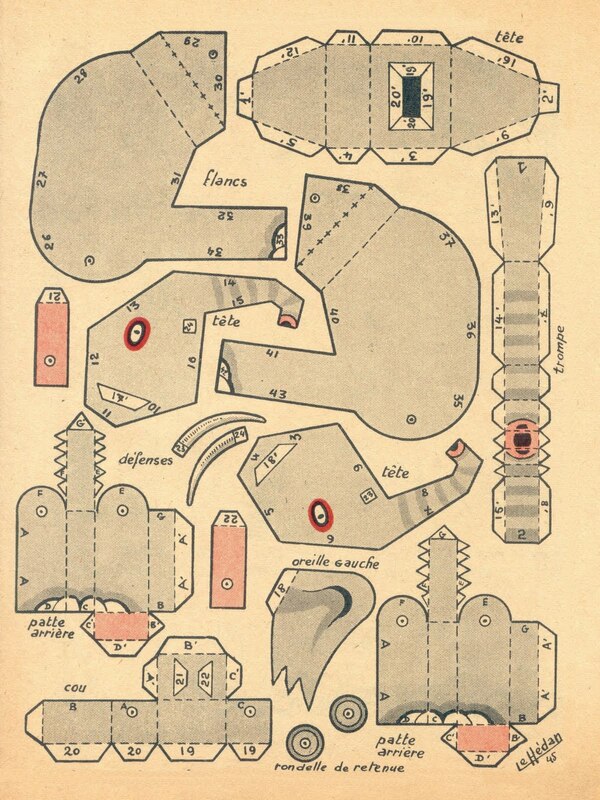 On cards, posters and decals, carved in wood, cast in bronze or plastic, suggested in stone, cutesy stuffed toys, fierce and friendly, the images are simultaneously divine and symbols of divinity. 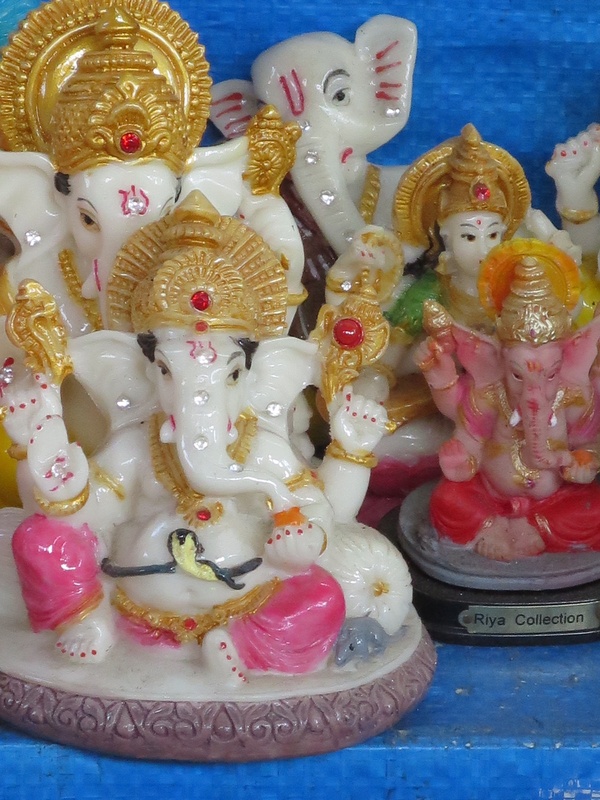 In a big Indian city like Kolkata the images are harder to see through the exigent overburden of daily life, but they are there on a taxi driver’s dashboard, the back of a pedal rickshaw, in jewelry, set into the wall in front of a hospital, for sale in smart shops. 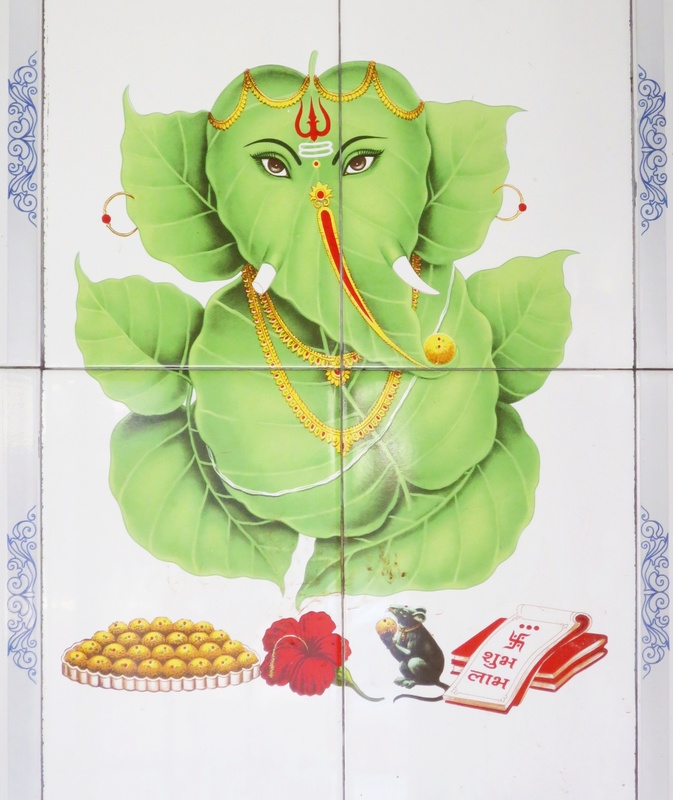 Images of Ganesh take many forms and styles, from classic to baroque to pop, kitsch, abstract and post modern, some barely recognizable, but the elephant is always there in the curve of an ear or trunk. In homes he joins the pantheon of gods with their consorts and vehicles just inside the front door, in a corner of the sitting room, on a bedroom wall. 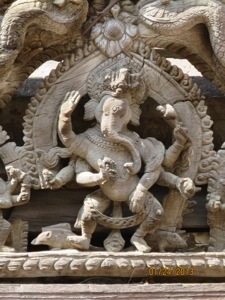 A chubby boy will be affectionately called Ganesh. 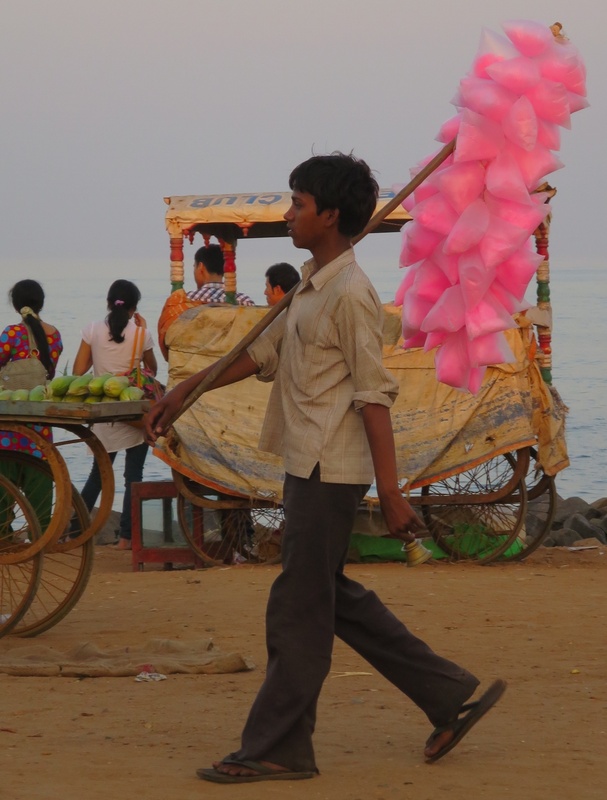 Shopkeepers invoke him at the start of a business day to bring good trade. 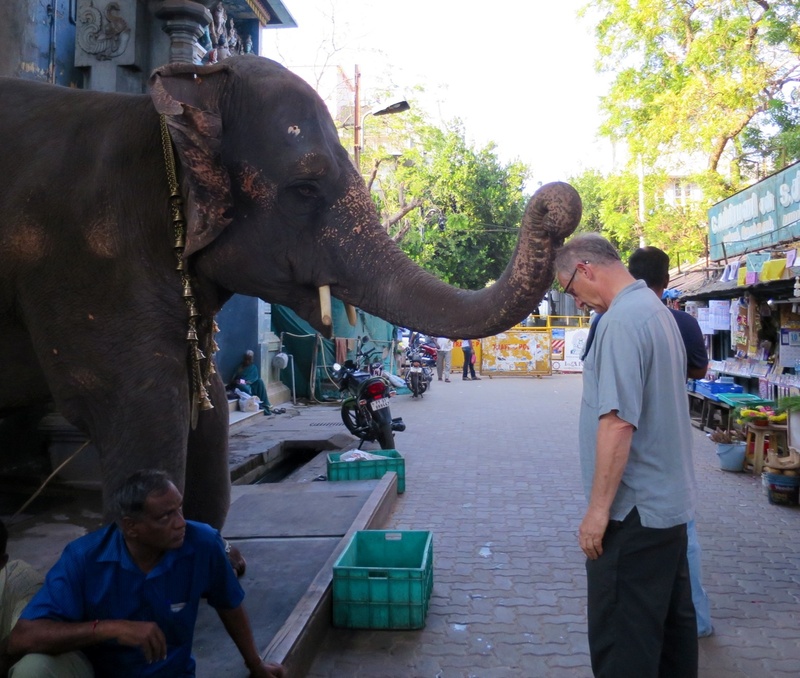 In Pondicherry, as in other cities in the south, real elephants live at temples where they are painted, adorned, fed, displayed and worshiped. 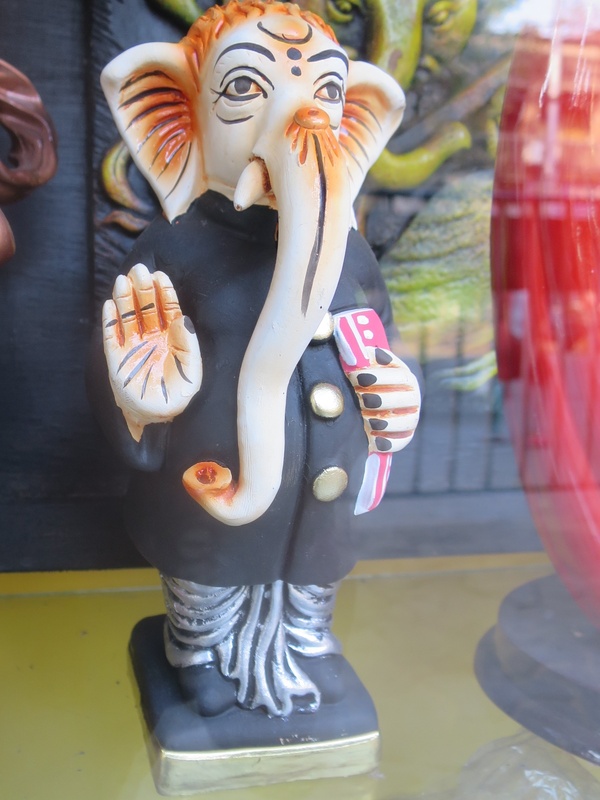 They will give a blessing, a touch on the head with the trunk in exchange for money or food. The paper money goes directly from the trunk to the hand of the keeper, but coins disappear to be retrieved later. 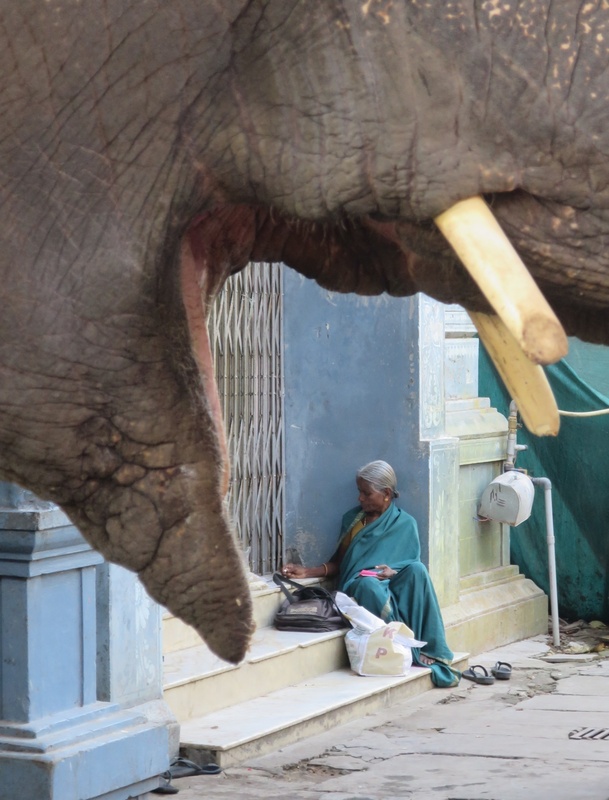 The female temple elephant in Pondicherry is named for Lakshmi, wife of Vishnu, goddess of wealth. Her solitary, restricted life has given her the neurotic, repetitive movements of kept animals, the rocking and pacing seen in zoos, but she makes good money. 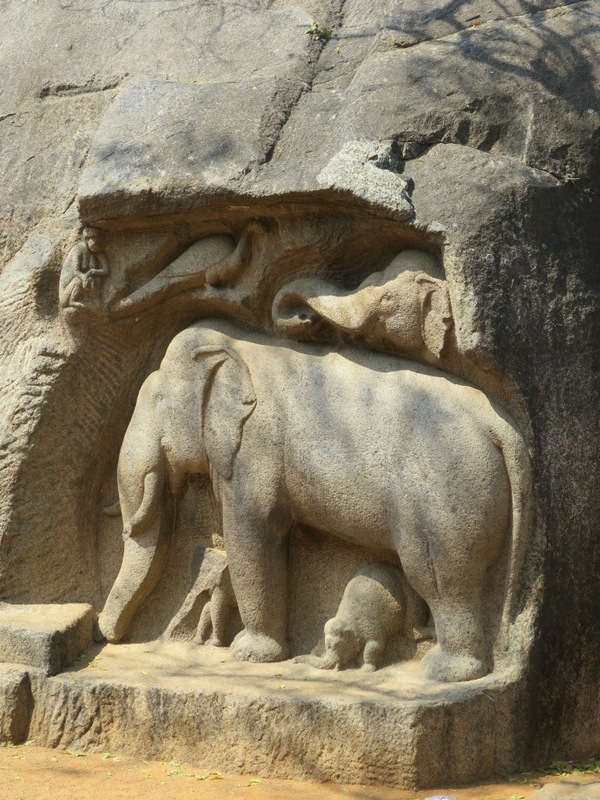 When a rock or a sculpture embodies a living deity, we don’t feel empathy for its frozen existence, but an elephant is a vigorous, intelligent, highly social animal. They can be trained, but not domesticated. 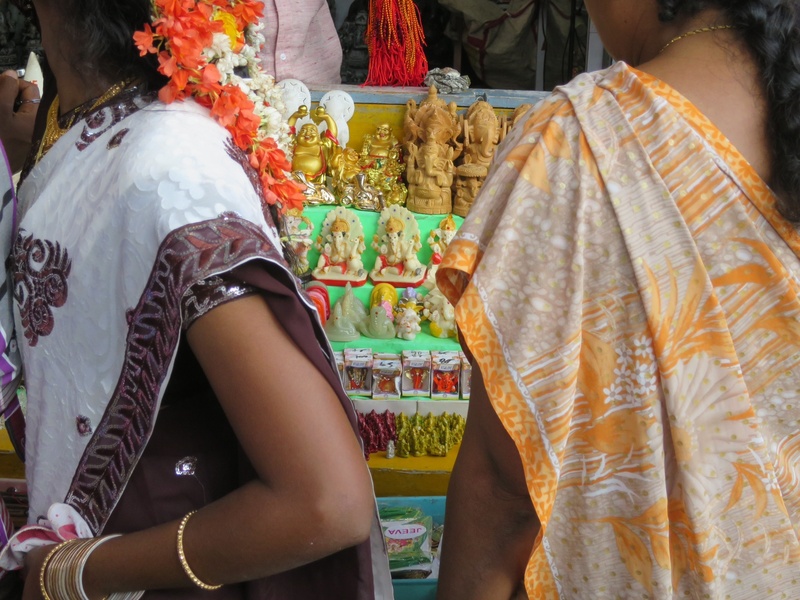 Lakshmi is not chained or bound by any visible means, but she is locked into a symbol, an expression of divinity. 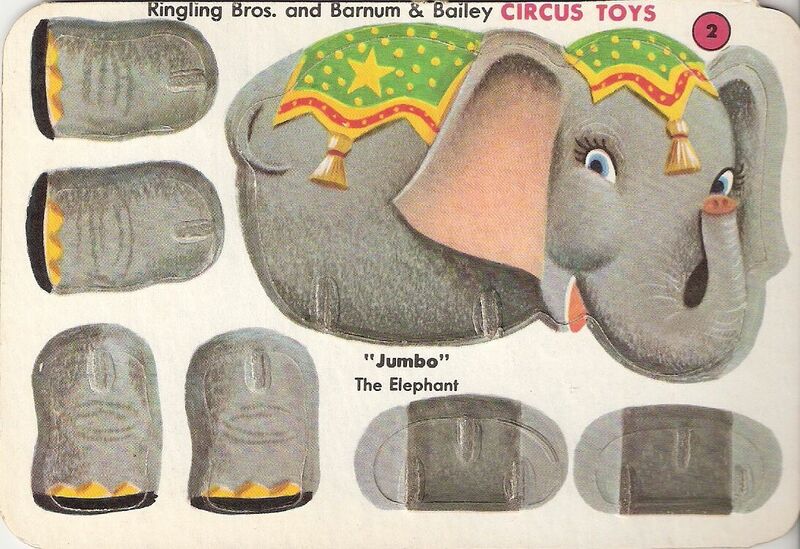 The blessing of her trunk is a charming, irresistable trick. The poor condition of her skin and feet is not dignified or divine, it is neglectful. The unchanging expression in her eyes is unfathomable and haunting, not cute, compassionate or fierce. 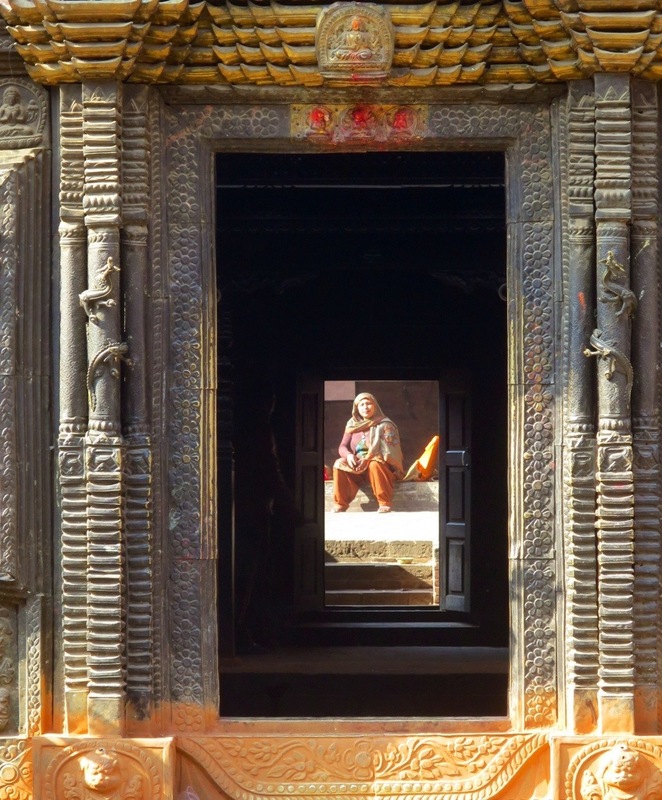 As I was wandering the backstreets of Bhaktapur a boy eager to practice his English asked me, "What are you searching for?" I replied, not searching, just looking. "Looking for what?" Just looking, looking at everything. The vector of my inquiry has been a path followed rather than controlled. After 8 days in Bhaktapur, Nepal, I have come to Kolkata to meet Abanti Chakraborty, Bengali theater artist, director and translator of classic western texts into Indian language and context. 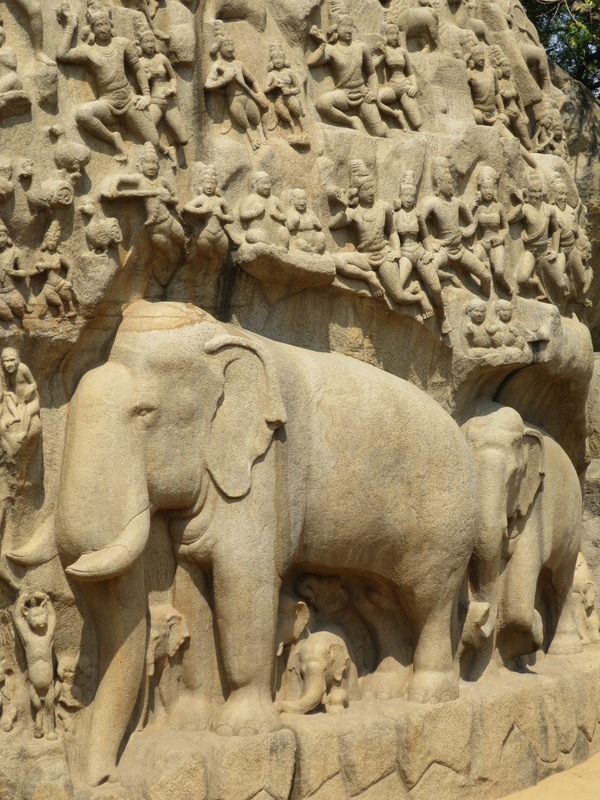 Together we will travel south to Kerala where, in the early 16th century, elephants were shipped by Portuguese factors to Lisbon, the capital of their empire, for the pleasure of King Manuel I. 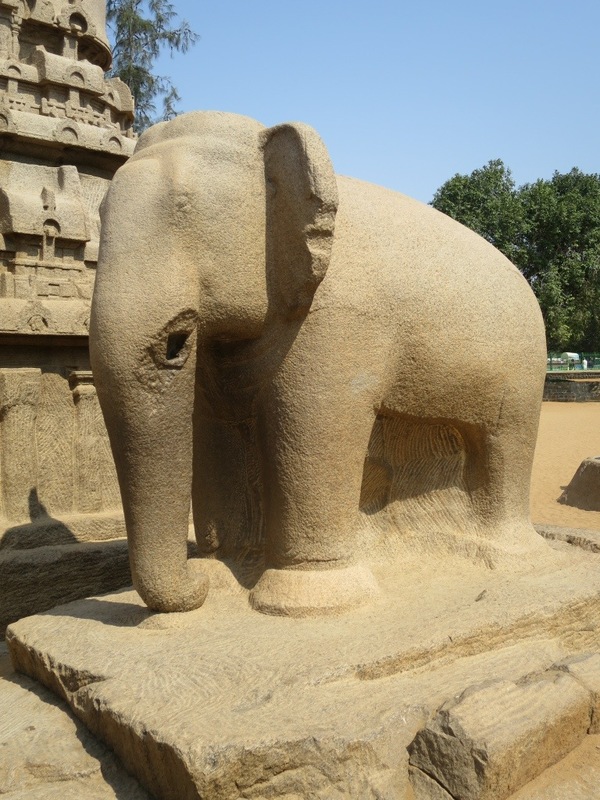 Our first stop will be Pondicherry, then Mahabalipuram to see the beach temples with their massive elephants carved into the native rock. From there we will cross to the center of India to Hampi to see the ruins of Vijayanagar and finally to Fort Cochin, Annone's port of embarkation for Lisbon. Together we will be looking, just looking at everything. Now to return from a necessary digression. 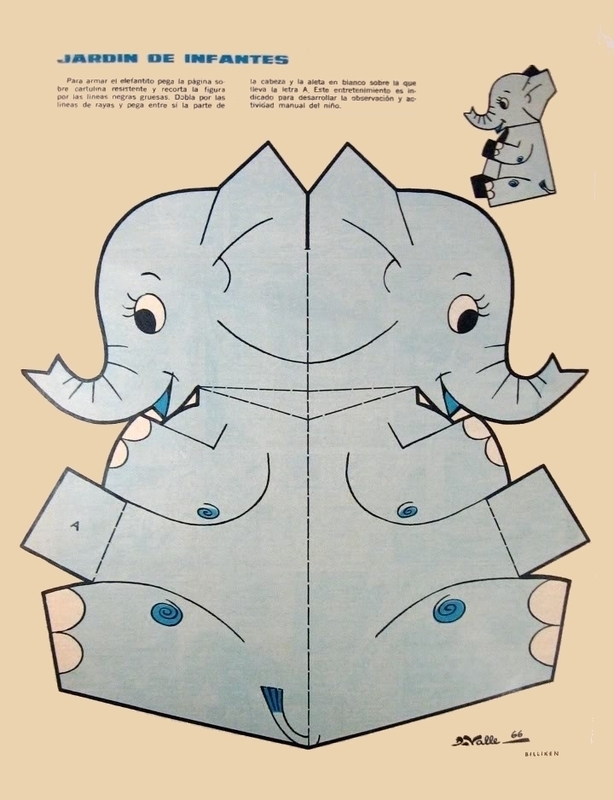 Annone- Elephants in Art and Imagination began as a record of my search and research into the story of Annone. 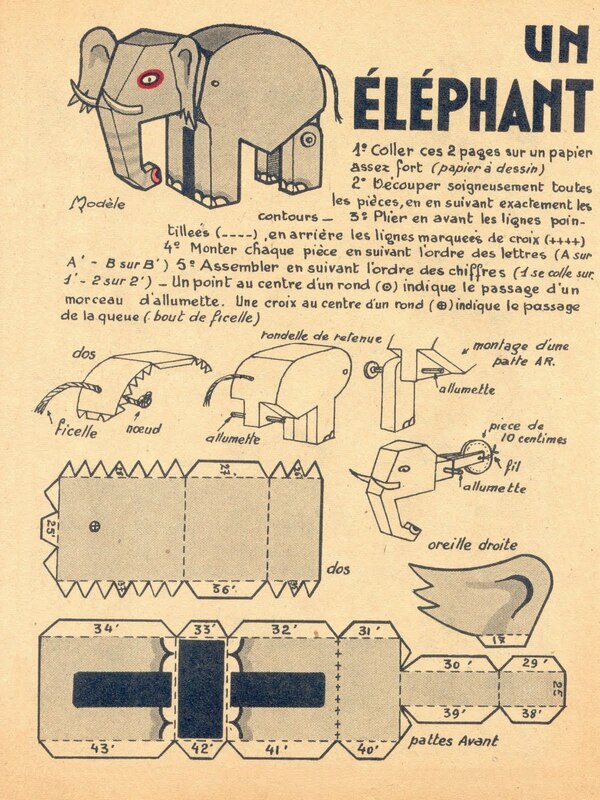 An internet message in a bottle, a call to artists and imagineers to follow the story of an elephant. 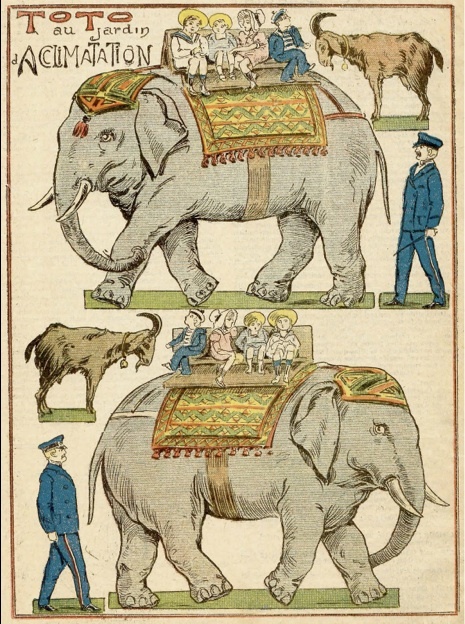 Not all elephants, plural, who desperately need a call to their defense, but one, historical elephant. The search led me on a journey through visual art, literature, historical documents and contemporary culture, and connected me to artists, writers and historians on three continents. It has been viewed 18,000 times from 140 countries, far beyond my wildest imagining. Now, I am following the historical, geographical, journey made by Annone from India to Portugal and finally to Rome. On March 19, 2014, I will celebrate the 500th anniversary of Annone’s walk into the eternal city, with an event and an exhibit. Not a party of culmination, but celebration of an arrival. The beast lived in Rome for 2 years, and it was the drawing of Annone, made for the fresco painted after his death, that inspired me in the first place. There will need to be another celebration on June 8, 1516.